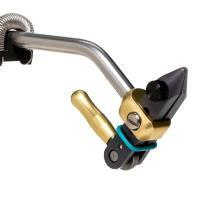 The Renzetti Vise C-Clamp is constructed of aluminum and finished with a black powder coating. 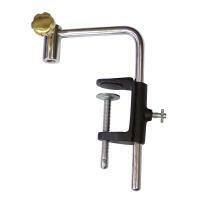 The C-Clamp comes with an 8 inch stainless steel stem and aluminum locking knob. It will fit tables with an opening from 3/4 in. to 2 1/2 in. thickness. 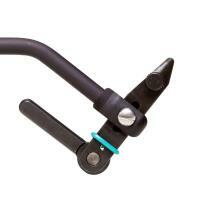 The Renzetti Vise C-Clamp is made in the U.S.A. The Renzetti Vise Midge Jaw is ideal for tying small flies and accommodate sizes #28 to #2 hooks. These jaws are constructed with a durable black oxide finish and provide excellent hook holding power and ample room to work around the jaws when tying. 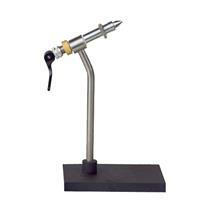 The Renzetti Vise Cam Jaw is made of heat-treated steel and coated with black oxide. The jaws are flat inside to prevent hook damage without affecting the hook holding power. 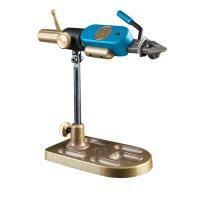 The Renzetti Vise Cam Jaw is made in the U.S.A. The Renzetti Vise Pedestal Base is durable and will stay in place when working with the vise. The vise comes with an anodized saltwater stem support, a stainless steel stem, and protective pad to keep your vise in place and protect your table. The stems are not interchangeable. 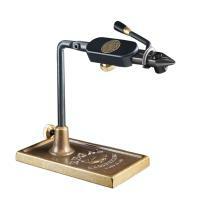 The Renzetti Vise Pedestal Base is made in the U.S.A. 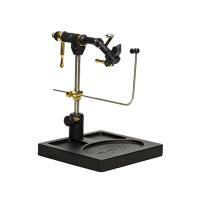 The Regal INEX Fly Tying Vise is a basic, moderately-priced vise outfitted with key essential features. 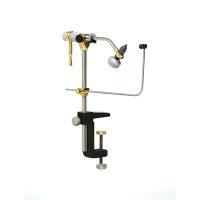 This vise features the traditional Regal head and jaws fitted on a non-rotating stem with a basic C-clamp. This vise will hold hooks sized from 22 to 1/0 equally well with no adjustments required. 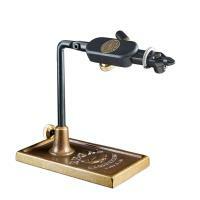 For a simple vise with excellent functionality, the Regal INEX Fly Tying Vise is a great choice. 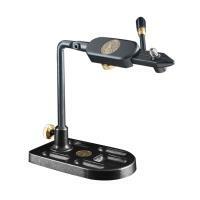 The Regal INEX Fly Tying Vise offers a limited lifetime manufacturer's warranty. 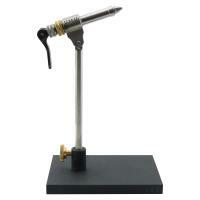 The Regal Fly Tying Stem for Revolution Vise is a replacement part for the Revolution vise. 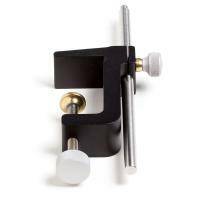 The Lon Straight stem is used with a C-clamp and the Short Stem is used with a pedestal base. 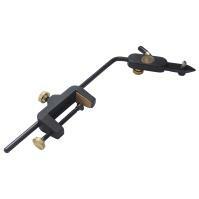 The Regal Fly Tying Vise C-Clamp is a great option for fly tying beginners or if you’re just looking for budget-friendly tying vise. This C-Clamp works well for the heavy fly tying tasks. The Regal Aluminum Pocket Base is durable, yet light enough to tie flies on the go. This base has five compartments for fly tying supplies such as hooks and materials, so you can keep them within easy reach when needed. 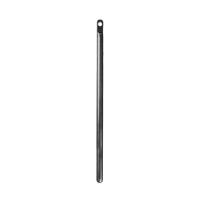 The Regal Aluminum Pocket Base is constructed from anodized aluminum and comes in a black matte finish. The Regal Royal Fly Tying Vise Clamp is handcrafted by fly angler pros. This clamp is constructed with a three-point anchor system with surface guards to ensure a secure, solid grip to your work surface. The Royal Fly Tying Vise Clamp will attach to surfaces between 1 and 3 1/4 inches The best part is it is portable and light enough to take with you on fishing trips. 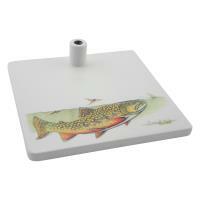 The Whitlock Signature Series Vise Base is a high quality, durable, ceramic vise base featuring a reproduction image of Dave Whitlock's art. 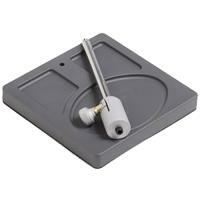 This base will fit any standard, straight-shafted fly vise stem and is held in place by an allen set screw. This base also features burled cork on the bottom to keep from sliding. 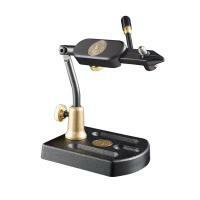 The Whitlock Signature Series Vise Base makes a great gift for your favorite fly angler, or just to treat yourself! Check out the remarkable and original art reproduction images. The Terra Vise Extender features a durable steel construction and is designed to create additional space for the vise. The extender helps reduce stress on your neck, back, and shoulder by moving the vise up and away from your desk, giving you extra comfort when tying flies. 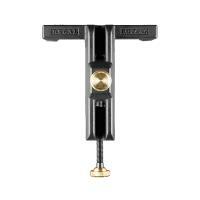 The Terra Vise Extender won’t disappoint with its stout profile and the low-cost price. Regal Revolution Stainless Jaw Vises are extremely versatile and strong, utilizing ultimate hook-holding power and the trusted Regal head design. 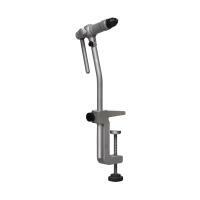 Each vise revolves a full 360° around the axis, and articulates 220° vertically. Whether you choose to rotate the vise and wind material on the hook, or tighten the barrel for a more traditional wrapping method, Regal Revolution Stainless Jaw Vises are the perfect tool for any job. 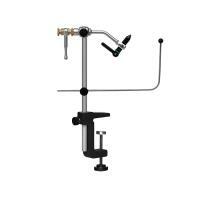 Renzetti Presentation Cam 4000 Series Vises allow for easy tying of various hook styles and sizes. Outfitted with a stainless steel rotary shaft and stem, brass rotary head, brass bobbin cradle, material clip, and anti-corrosion coated cam jaws, these vises have all the features and functionally you are looking for. Renzetti Master Vises feature a patented helical cam-operated jaw mechanism that securely holds a wide range of hooks, suitable for virtually everything from tiny trout flies to large feather-duster sized billfish. Whether you're tying them commercially or for personal use, the amazing features this vise offers will surpass all expectations. 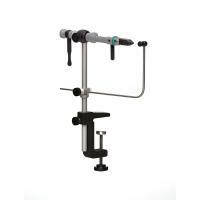 Renzetti Master Vises are truly an essential, all-in-one piece of equipment. 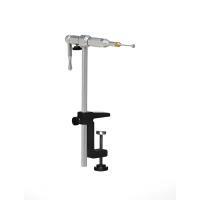 The Renzetti Apprentise Rotary Vise C-Clamp offers incredible functionality, simplicity, and efficiency. 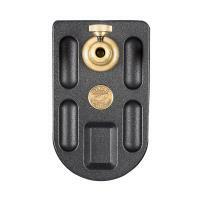 Whether you are new to tying your own flies, or have many years experience, the Renzetti Apprentice Rotary Vise C-Clamp is perfect for all fly fishing enthusiasts. The HMH Spartan Vise features a black powder coated chassis and plate steel pedestal base that is not only very nice looking, it is also extremely durable. The infinite angle head adjustment and ultra smooth full 360 degree rotary action are sure to meet the needs of all tiers and at a great price. The HMH Spartan Vise is made in the U.S.A.
Regal Travel Vises make it easier than ever to take your vise along, where ever you go. The newly designed base has been reduced in length and weight but still offers a solid tying platform. These vices weigh in at approximately two pounds. The unique design of the Regal heads consistently holds the hook in place better than any of the competitive vises on the market, allowing for immediate change in hook sizes with absolutely no adjustments required. Regal Revolution Big Game Jaw Vises are built specifically to tie saltwater and large fresh water flies. 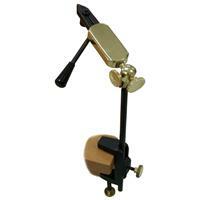 This vise handles flies for tarpon, bill fish, pike, musky, salmon, bass, and anything in between. The Big Game Jaw features three hook grooves machined into one side of the jaw to accommodate such a wide variety of hook sizes with ease. From tarpon to trout, this is one great vise! Regal Revolution Traditional Jaw Vises consistently hold hooks sized from 22 to 1/0 extremely well with absolutely no adjustments required. This is a great feature when tying multiple different sized flies in a sitting. You can tie a size 18 dry fly and then tie a size 1/0 bass popper without needing to adjust the vise, this often saves time and frustration. Regal Medallion Series Big Game Jaw Vises feature Regal's most versatile jaw. Big Game Jaw Vises are built specifically to tie saltwater and large fresh water flies, and are able to handle flies for tarpon, bill fish, pike, musky, salmon, bass, and anything in between. The Big Game Jaw features three hook grooves machined into one side of the jaw to accommodate such a wide variety of hook sizes. Regal Medallion Series Stainless Steel Jaw Vises have the smallest profile jaw in the Regal line of vise jaws. The Regal Medallion Series Stainless Steel Jaw Vises consistently hold hooks sized from 32 to 2 extremely well with absolutely no adjustments required, allowing you to tie multiple sized flies in one sitting. This jaw is extremely versatile, making it the trout fisherman’s dream vise. 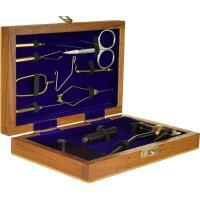 Regal Medallion Series Traditional Jaw Vises rotate 360 degrees and pivot 220 degrees up and down. 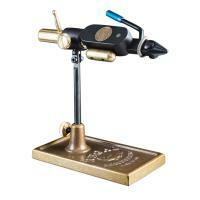 The Traditional Jaw has been the standard jaw and the workhorse of Regal fly tying equipment for many years. The performance of these vises lies in the unique design of the head and jaws. The Regal Medallion Series Traditional Jaw Vises consistently hold hooks sized from 22 to 1/0 extremely well with absolutely no adjustments required. Regal Medallion Series Midge Jaw Vises have been specially designed for tying small flies down to size 32 and as big as size 6. These vises rotate 360 degrees and pivot 220 degrees up and down, and offer outstanding performance thanks to the unique design of the head and jaws. The ergonomically designed forefront provides the tier with comfort when tying small flies, but also allows for tying traditional sized flies as well. 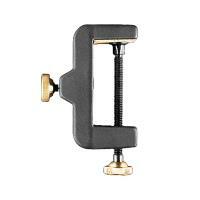 The Terra Rotating Spring Action Vise is a "C" clamp fly tying vise with a brass and non-glare black finish. The Rotating Spring Action Vise is perfect for the entry-level tyer just starting out and wanting a basic vise. 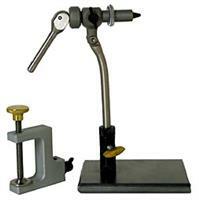 This vise features an economical price but is extremely well made and is built to last. 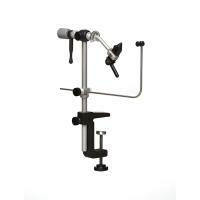 The Terra Rotating Spring Action Vise is easy to use, just squeeze and release. The spring action jaws securely hold the hook in place. 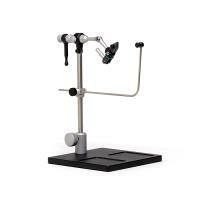 Griffin Superior 2A Vise will hold fly hooks as securely as vises costing three or four times as much. This is a C-clamp style vise. Offers a Manufacturer's lifetime warrant. The Griffin Superior 2A Vise is made in the U.S.A. 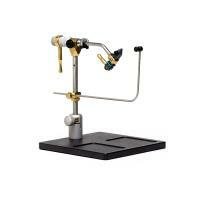 The Wolff Indiana Apex Fly Tying Vise sets the standard for a quality, American made vise. 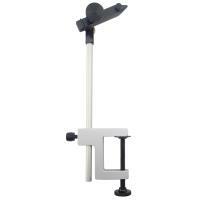 The Apex features in line rotation with an easy to use rotary handle for 360 degree fly inspection. The Apex also features machined stainless steel construction, hardened, tool steel jaws with hook grooves, and a material clip. 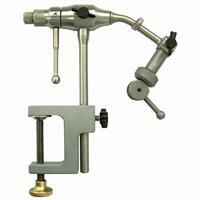 The Wolff Indiana Apex Fly Tying Vise is made in the U.S.A.